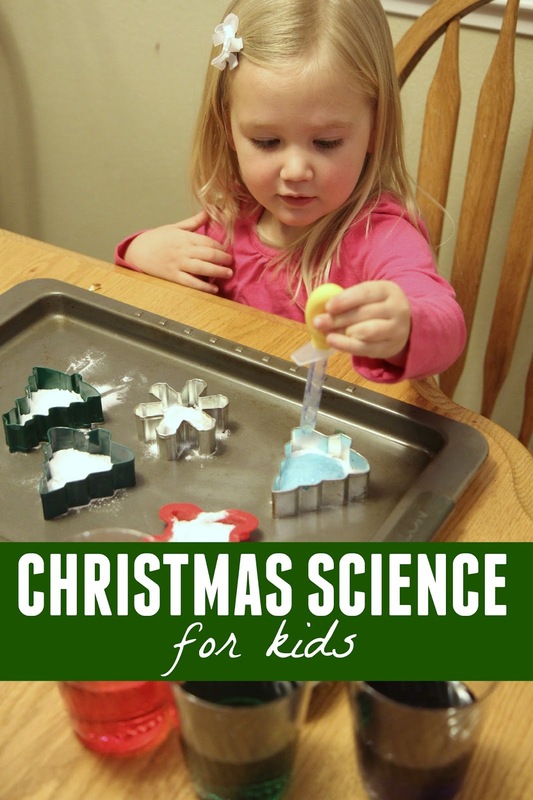 Today we are doing a little Christmas science!! 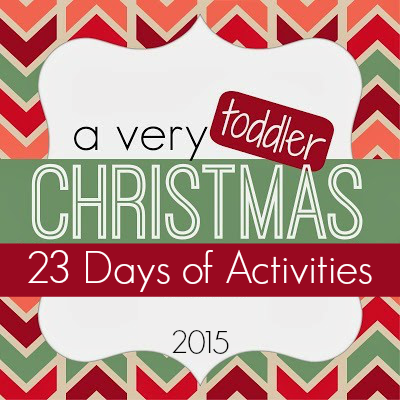 This was hands down the favorite activity in our A Very Toddler Christmas newsletter last year and the year before, so we had to do it again! Have you ever tried doing the classic fizzy drips science activity using baking soda, food coloring, and vinegar? 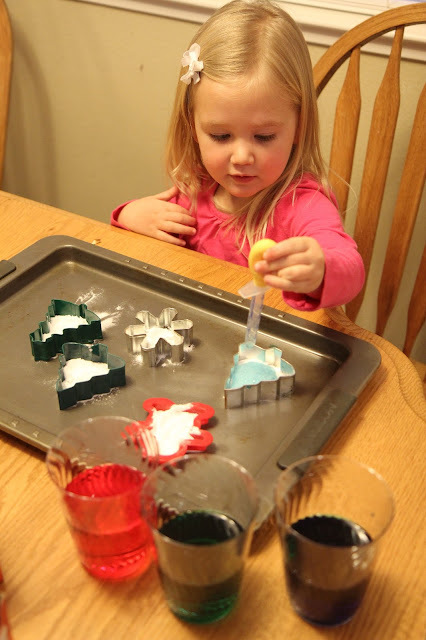 For Day 6 of our A Very Toddler Christmas series we are doing Christmas cookie cutter fizzy drips science! 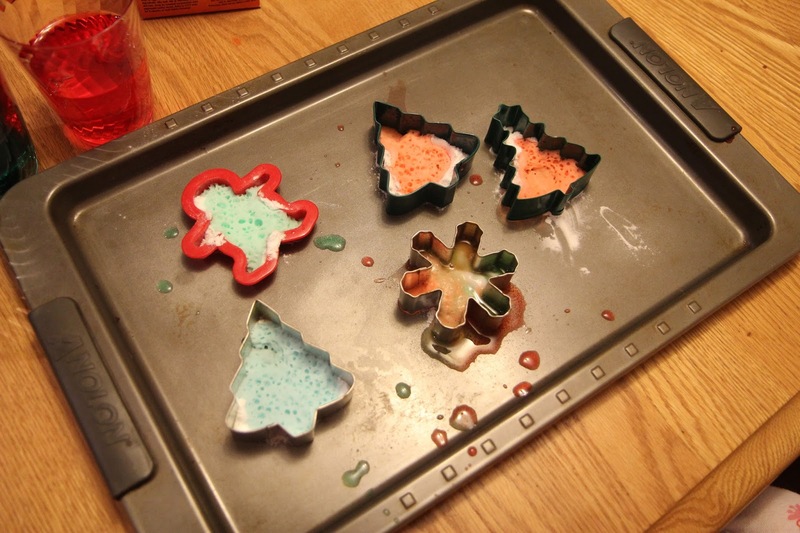 *If you don't have any molds/cookie cutters.. no stress, just adapt this using what you do have. To get started you'll want to fill up a few small cups with colored vinegar. I put a few drops of food coloring in each cup of vinegar and then my daughter helped me mix them up. I had a blue cup, red cup, and green cup. 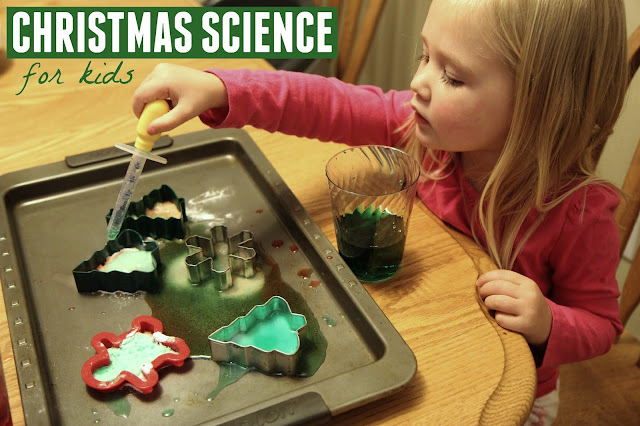 Next place the cookie cutters onto a baking pan and then have your kids help scoop baking soda into each cookie cutter. This is great fine motor exercise and requires a lot of concentration. 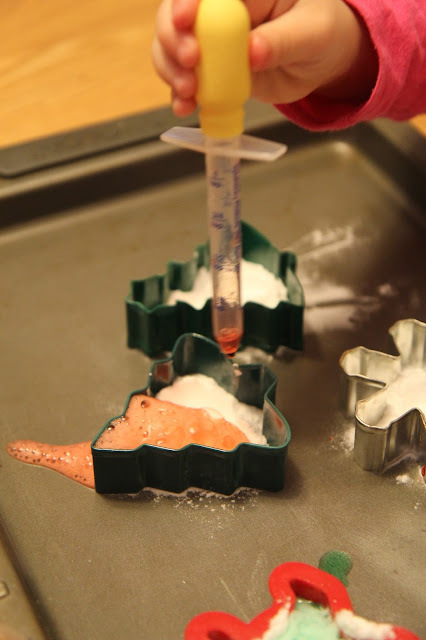 Once the cookie cutters are filled with baking soda, have your child fill up their dropper with colored vinegar solution and squirt it into each cookie cutter. My daughter had the best time making the baking soda "explode" (as she called it) and thought it was really neat that everything stayed contained inside the cookie cutter for a little while. We mixed colors, decorate the Christmas trees with colorful drips, and mostly just had fun goofing around. I think we did this activity for almost 30 minutes (I just cleaned everything off once it got icky and then we set it up again and again). It was fun to make predictions about what was going to happen and guess how much vinegar could go in each cookie cutter before it started leaking all over the pan. We did a lot of little experiements to test things out. Science activities seriously rock! If you try any of these, pass along your thoughts! If you missed any of our previous A Very Toddler Christmas series posts you can find them all HERE(just scroll down). Yesterday we shared a simple Christmas tree treat and the day before we did a Christmas toss game. We have been having so much fun with this series!